In the words of American professional tennis player Arthur Ashe, "Start where you are. Use what you have. Do what you can." We could not ask for a better illustration of the commitment behind the 2018 Scholarship Challenge. At the close of another successful fundraiser we extend our sincere thanks to each person and every UELAC branch who joined us in supporting UELAC scholarship. Twelve UELAC branches head the list of generous donors! That's a new record for scholarship giving and one that is greatly appreciated. A big round of virtual applause to – Abegweit, Assiniboine, Bicentennial, Colonel John Butler (Niagara), Governor Simcoe, Grand River, Kawartha, London and Western Ontario, New Brunswick, Nova Scotia, Saskatchewan, and Vancouver. Huzza! As of June 30th the total in scholarship giving is $6,988.00. Thank you! Our Donor Appreciation List acknowledges the generous individuals behind the success of the 2018 Scholarship Challenge. We know that there are donations still coming in and look forward to adding them to our grand total. Our goal of $10,000.00 is within reach. This year UELAC celebrated 20 years of UELAC Scholarship. Since its beginning in 1998, eleven students have received funding towards completion of a graduate degree in relevant Loyalist research. In the past three years, with your help, we have raised over $24,000.00 for Loyalist scholarship. Amazing! Stay tuned for updates and news on the scholars you support. Coming in the fall, look for a feature article in the Loyalist Gazette by Kelly Grant, 2018 Loyalist Scholar. Please remember, donations to Loyalist Scholarship or the Scholarship Endowment Fund are welcome throughout the year. Should you wish to make a memorial gift we will ensure that recognition is given to those you wish to honour through your donation. Again, thank you for your continued support of a very worthy initiative. Our mission to preserve, promote, and celebrate the history and traditions of the United Empire Loyalists is flourishing through scholarship. Breaking News: Congratulations Dr. Jones! This past week Sophie Jones, 2016 Loyalist Scholar, passed the PhD Viva – oral examination, successfully defending her doctoral dissertation. Sophie shared the good news on social media extending 'huge thanks' to the United Empire Loyalists' Association of Canada along with other organizations, "who have all provided generous financial assistance & invaluable access to the expertise of their communities." Heartfelt congratulations to Sophie! We look forward to following your career path and wish you continued success in every endeavour you undertake. It is Bailey who described Margaret as "very clever" and "sensible and . . . prudent in the management of family affairs..." – a woman with "the gleanings of a very ample estate". The new Mrs. Wiswell brought a "dowry" to her marriage. She had the monies from the sale of a house in New York and the promised inheritance of her late husband's personal estate. In July of 1786, Margaret sought compensation for John Hutchinson's wartime losses when the Royal Commission on the Losses and Services of American Loyalists (RCLSAL) convened in Halifax. In addition to the personal testimony of Thomas Millidge, New Jersey's former surveyor general, Margaret had "certificates" verifying her late husband's loyalty from Brook Watson the former British commissary general in New York City, General Courtlandt Skinner of the New Jersey Volunteers, Chief Justice William Smith of New York and David Ogden, a loyalist judge of New Jersey's supreme court. Francis Hutchinson, now a young man of twenty-two, also testified on his mother's behalf. What is puzzling about both the testimonies of Margaret and Francis is that they each only referred to the death of two Hutchinson brothers where other documents speak of the wartime deaths of three brothers: William, Major and Ralph. Why would Margaret and Francis fail to mention all three? The RCLSAL commissioner did not immediately make a decision on Margaret's appeal as he needed to see John Hutchinson's will. Over a year later, when the compensation board met in Montreal, the RCLSAL finally obtained the loyalist's will from his New York City lawyer and made its decision to compensate the loyalist widow. On December 9, 1789, Margaret attended the wedding of her only surviving son, Francis, and Bathsheba Ruggles. Like the groom, the bride was also the child of a loyalist – and the granddaughter of General Timothy Ruggles, one of Massachusetts' most noteworthy loyalists. Over the next ten years the young Hutchinson couple would have six children. Bathsheba died in February of 1800. A year later Francis married a widow named Fanny Lowden Nixon. In 1815, Francis died in a drowning accident – the same cause of death as his father John and brother Major more than 35 years earlier. Ann Hutchinson, Margaret's youngest daughter, married Henry Burbidge in February of 1798 when she was 26. It is not known if this couple had children. Ann died sometime before 1831. What is amazing to consider is that despite the difficult times she had endured as the wife of a loyalist, Margaret Hutchinson Wiswell lived to see all of her grandchildren. Sadly, she also attended the funerals of all of her children as well as her second husband, John Wiswell. The "very clever" loyalist wife took her last breath on Friday, August 6, 1830 in the refugee settlement that had been her home for the last forty-seven years. Margaret Jefferson Hutchinson Wiswell died at the age of 93. But this is just half of a loyalist love story. Learn more about the Rev. John Wiswell, Margaret Hutchinson's second husband, in next week's Loyalist Trails. On the 240th anniversary of the building of the chain, we shed light on its role in the Revolutionary War. From the earliest moments of the War for Independence, each side knew that the key to victory was the Hudson River. The hotbed of the revolution was in Boston and most of Gen. George Washington's nascent Continental Army were from the northeast. The river separated the northeast from the rest of the country. If the British took control of the river, the head would be cut off from the body, and both sides knew what would follow. By 1776, the British had seized New York City and held on to Canada, and had a water route just about the entire way between the two. Blocking British ships became paramount. But American fortifications in the valley were not sufficient. Gen. George Washington needed a great idea. He got it from an English-born patriot named Thomas Machin. The cost of the lost rebellion in North America, followed by the cost of the Napoleonic War, left England virtually bankrupt. There was no silver or gold in the Treasury. As a result, the minting of coins stopped except in a few spotted years, and even coins captured from other countries, were over-struck to provide England with coinage. Since 1970, the old currency of the United Kingdom has been abandoned in favour of a decimalized currency. In the 18th. century however, coins consisted of: 4 farthings = 2 half pennies = 1 penny, 12 pennies was 1 shilling, 10 shillings and 6 pence (pennies) was a half guinea, 20 shillings was a (£) pound sterling, and 21 shillings was a full guinea. So a pound was 240 pennies which would have weighted a number of avoirdupois pounds. Not something you could carry around with you. English currency was written as 1/1/10, meaning £1/1 shilling and 10 pennies or if you use the old designations; 1 librae, 1 solidi, and 10 denarii. The common people hardly ever saw anything more than farthings, half-pennies and pennies. Obtaining the essentials of life often led to thievery, and transport to a gaol (prison) or workhouse, or in extreme cases, transportation to a penal colony like Australia. Three pictures of coins of the Realm are shown here. The first is a farthing from 1773 (struck, unusually, in North America just prior to the rebellion). The second is a half penny from 1807, and lastly, is a 1797 Cartwheel penny (so called because of its thickness and the thick ring around the edge of the coin). What did life's essentials cost around the time of the rebellion? A penny could buy you a one pound loaf of bread, or enough gin to get drunk on, or a quart of beer. As the old advertising saying goes." Drunk for a penny, dead drunk for tuppence (i.e., two pence). Tuppence could also buy you half of a shared bed to sleep on in what today we would call a flop-house. One and half pennies could buy you a meal at an Irish cookhouse (i.e., not a restaurant as we know it). One penny bought you enough coal to keep warm for one day (if you actually had a place to stay). Three pence could buy you a supper of bread, cheese and beer. Four pence might buy you a pound of domestic (homemade) cheese, which with a half penny more would also mean you had a half pound loaf of bread to go with the cheese. If you wanted to wash it down with beer, you needed another penny to buy these things individually. For two workmen, 10 pennies (10d) could buy a pound of fat bacon for dinner. In contrast, for some of the white shirt workers, the costs were far higher. 6 1/4d (Sixpence and a farthing) would buy dinner for a government clerk consisting of cold meat, bread and a pint of porter. A shilling (12p) would buy the same chap dinner in a steakhouse with beef, bread and beer, and it would also include the tip. Our same chap could spend an evening at a coffee house for eight pence (written as 8d). For the overlords, some amazing prices stand in stark contrast to the price of being poor. A bottle of champagne was -/08/- or 8 shillings. A pound of coffee was 4 shillings and 9 pence. Tea was even more expensive. 10 shilling and 6 pence would get him a ticket to hear Handel's Messiah with Handel on the organ at the Foundling Hospital. 6 pounds (£6/-/-) was the cost of a night out, including supper, a bath and a fashionable courtesan. The value of a single British pound sterling about 1783 was approximately $153.19 USD in today's money. So an English penny in 1783, had the value of about 64¢ US in today's currency (2). Today, £1 is the equivalent of about $1.73 CDN, far less than would have been the case in 1783, if Canadian currency had even existed at that time! 1. “The Cost of Living: London, mid 1700s.” <http://footguards.tripod.com/08HISTORY/08_costofliving.htm>. Accessed 11 July, 2018. 2. Eric W. Nye, “Pounds Sterling to Dollars: Historical Conversion of Currency.” <https://www.uwyo.edu/numimage/currency.htm>. William Taylor (1760 - 19 July 1842) was an officer in the Royal Navy who served during the American War of Independence and the French Revolutionary and Napoleonic Wars. In his last moments, with calculated efficiency, he bolted the bedroom door so no one could interrupt the execution of his final act. Charles Craig ended his life with the same cool determination and secretiveness that characterized his public service as a soldier, a cavalryman and an able practitioner of the dirty business of intelligence. Not all of the Revolution's wounds were physical. War and social upheaval could wreak havoc on the reputations and psyches of many caught up in its chaos. Even the most capable and honorable might be numbered in its human toll. Charles Craig's life began auspiciously enough. Born to a family prominent in Northampton County, Pennsylvania, between 1744 and 1750, he was endowed with economic and social advantage which, combined with his own natural abilities, heralded a rise to prominence. He was a modest young man, but like the rest of his family, active and ambitious. His family's early history and ties to Pennsylvania's influential Allen family influenced Charles Craig's actions. Around 1728, his grandfather, Thomas, was one of the founders of what was called the Craig or Irish Settlement, based around the Presbyterian congregation near Weaversville in Northampton's Allen Township, northeast of present-day Allentown, then the frontier. The Craigs were related to William Allen (1704-1780), the wealthy chief justice of the Pennsylvania Supreme Court, from whom some of the clan purchased their Northampton lands. The two families maintained cordial relationships. Working on material culture, my research has taken me to some interesting, if unexpected places. Last summer, it involved waiting outside Saint John's Church in Portsmouth, New Hampshire, founded in 1732 as the Anglican Queen's Chapel. I quickly ran inside to snap some pictures of a baptismal font between back-to-back Sunday services. The Saint John's font is an impressive fixture, carved from marble in a Continental European baroque style. As a ritual object used in the sacrament of baptism, the font is hardly unusual, but its story is. A colorful body of apocryphal literature can be found that gives various explanations of the font's earliest origins and even its material, with one author mistakenly describing it as "a curious font of porphyry" in the 1890s. Yet, the font's brass cover offers a rather straightforward account. Dated 1761 and composed by churchwarden Wiseman Clagget, the Latin inscription on the lid reads "Sarah Catherine and Anna Elizabeth, accomplished daughters of Captain John Tufton Mason, generously gave this Baptisterium, acquired from the French at Senegal, under the auspices of the above-mentioned John, to the Anglican Church at Portsmouth." Read more (much reference to the Seven Years War and Canada). Supervisory Park Ranger Garrett Cloer joins us to explore the Longfellow House-Washington's Headquarters National Historic Site so we can discover more about the Siege of Boston (1775-76), the birth of the Continental Army and the life and work of Henry Wadsworth Longfellow. During our exploration, Garrett reveals the early history of the house that John Vassall built; Details about how the Vassall House came to serve as George Washington's home and headquarters during the Siege of Boston; And information about how both Washington and Henry Wadsworth Longfellow used and experienced life in the house. Do You Have a Story for the Loyalist Gazette? An opportunity to be published in a periodical. Do you have, or do you know someone who has a story about the Loyalists, their times, that era? It could be a Loyalist history, a profile of Loyalist descendants, your research challenges and successes, historical items of the era. Share and help build the experience and legacy of the United Empire Loyalists. I am gathering information now until 1 September when we will begin building the Fall 2018 Loyalist Gazette, to be distributed 1 November. Send to me a note about your idea for an article. I look forward to discussing with you. Where are Diane Reid, Andrew Fleming and Linda Young of Toronto Branch? George Brown House, operated by Ontario Heritage Trust, in Toronto is the home of the UELAC national office. On Thursday July 19 at 6:30pm, Heritage Toronto will host a tour on the influence George Brown had on the city! An advocate of the abolishment of slavery, Brown founded the Anti-Slavery Society of Canada in Toronto. The tour includes a visit to George Brown House. There is a fee; registration required. 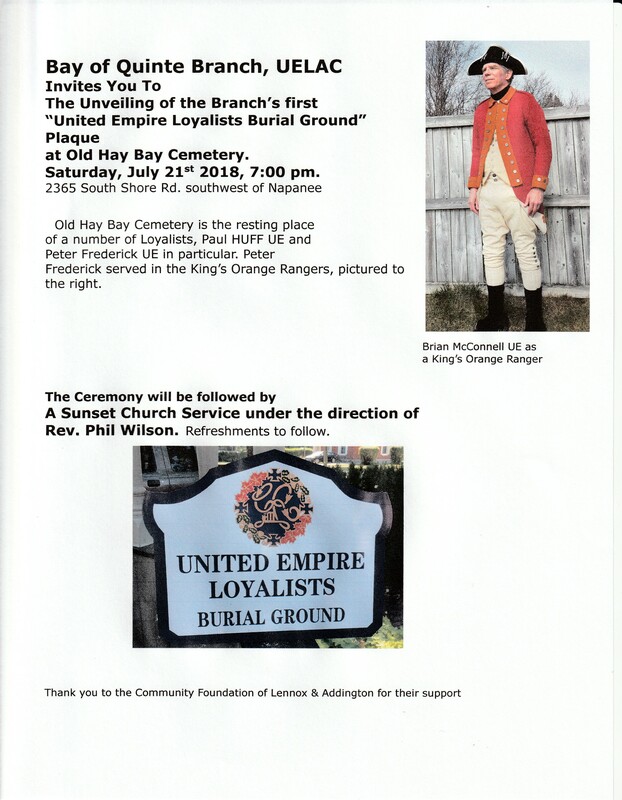 Hay Bay Cemetery will be "plaqued" as a "United Empire Loyalist Burial Ground" by Bay of Quinte Branch on Saturday 21 July 2018 at 7:00PM. Loyalists buried there include Paul Huff UE and Peter Frederick UE. Sunset Church Service and refreshments to follow. You are invited. See flyer. 14 Jul 1780 Washington writes to Congress to inform them that French fleet under Rochambeau sighted off Newport, RI. 13 Jul 1776, In a letter to John, Abigail Adams reports that she and the children have been inoculated against smallpox. The side effects were so severe that they wouldn't be released from medical care until August 31. 13 Jul 1787 Congress enacts NW Ordinance, establishing means of making 3-5 states without slavery out of territories. 12 Jul 1780 Patriot forces, learning of interrogation of commander's wife, ambush Loyalists at Brattonsville, SC. 11 Jul 1779 British burn most buildings in Norwalk, Conn. in reprisal for privateering & espionage based there. 10 Jul 1777 British General Prescott captured by rebels for the second time, this time in Rhode-Island. 9 Jul 1777 NY elects 1st governor as independent state; George Clinton is later VP to Jefferson and Madison. 8 Jul 1776 Liberty Bell is rung to announce public reading of Declaration of Independence. Fashion exhibitions often take a forensic approach to display but I love more whimsical approaches too, contextualising dress in wider social spaces. New Museum of Fine Arts Boston "
I was delighted to find this sole pattern (for shoe uppers) in my 1778 lady's magazine. Silk satin London-made buckle shoes, 1780s. My ancestor, Timothy Perkins, and his brother, Joseph, were privates in Capt. Benjamin Perkins' Company of Col. John Phillips' Regiment, Jackson's Creek Militia, Camden District, SC. This unit served under Lord Rawdon during June and July, 1781. They also served under Capt. Joseph McDaniel in Capt. Thomas Pearson's Regiment, Little River Militia, Ninety Six Brigade, for 34 days, sometime between 6 May and 5 August, 1782 (Murtie June Clark, LOYALISTS IN THE SOUTHERN CAMPAIGN OF THE REVOLUTIONARY WAR, vol.1, pp. 164,168,313, quoting Pay Records in the Public Record Office). In 1784, George Morris was appointed Guardian to Gebas Perkins, orphan, (Wilkes Co., NC Will Bk 1, p. 123). This would indicate that Timothy Perkins was dead or that his property had been confiscated. No mention of him alive is found after 1782. His brother Joseph Perkins lived out his life in Virginia and North Carolina. What do I need to do to apply for a Loyalist Certificate and would I be eligible for UEL membership? As you have proof that the ancestor served in a Loyalist corps and since he made the 'ultimate sacrifice' I see no reason to avoid applying to the UELAC for a Loyalist certificate; he gave his life for the Cause. Membership is open to anyone interested in the Loyalists, but members with such ancestors often opt to acquire a UE certificate proving their descent. You join the UELAC by joining a Branch and that Branch can either be where you live or where your ancestor lived, although the latter not an option in this case as we have no Branch in SC. There are almost 30 Branches across Canada and you are free to join which ever ones you wish.